Shanon married Nathaniel Kent Banner, son of Michael Paul Banner and Suzanne Grace Woodward, in September, 2009. Shanon Renee Akans is online at https://www.facebook.com/profile.php?id=1177565089. Ebenezer Alden, Memorial of the Descendants of the Hon. John Alden, , at https://books.google.com/books?id=1zouAAAAYAAJ . Randolph, Mass. : Samuel P. Brown, (1867) , p. 87. 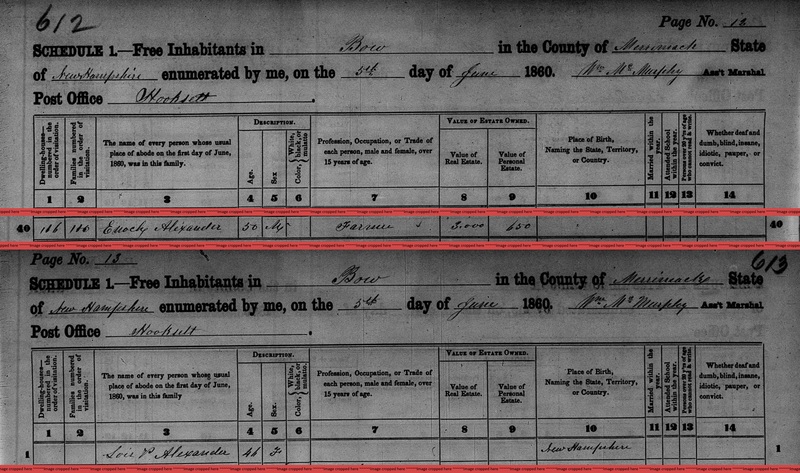 "United States Census, 1850," database with images, FamilySearch (https://familysearch.org/ark:/61903/1:1:MD9R-TB8 : accessed 19 November 2015), Anna Chamberlain in household of John Alden, Westfield, Hampden, Massachusetts, United States; citing family 285, NARA microfilm publication M432 (Washington, D.C.: National Archives and Records Administration, n.d.). Seth C. Cary, John Cary, the Plymouth Pilgrim (n.p. : Seth C. Cary, Dorchester Center, Boston, MA, 1911, unknown publish date), p. 130, sec. 77. John Adams Vinton, The Vinton Memorial: Comprising a Genealogy of the Descendants of John Vinton of Lynn, 1648: Also, Genealogical Sketches of Several Allied Families ... With an Appendix Containing a History of the Braintree Iron Works, and Other Historical Matter, , at https://books.google.com/books?id=swVaAAAAMAAJ . Boston: S.K. Whipple and company, (1858) , p. 290. Vital records of Bridgewater, Massachusetts, to the year 1850, Boston, Massachusetts: New England Historic Genealogical Society, (1916) , Vol. 1, p. 21. Joseph Alden was born perhaps about 1640. Lucy Mary Kellogg, Mayflower Families Through Five Generations, pt. 1. Family of John Alden, , at https://books.google.com/books?id=QjBnAAAAMAAJ . General Society of Mayflower Descendants, (1975) , p. 96. Charles Hallock, The Hallock-Holyoke Pedigree and Collateral Branches in the United States, , at https://books.google.com/books?id=JFxPAAAAMAAJ . Amherst, Mass. : Carpenter & Morehouse, (1906) , p. 50. William Richard Cutter, New England Families, Genealogical and Memorial: A Record of the Achievements of Her People in the Making of Commonwealths and the Founding of a Nation, Lewis historical publishing company, (1914) , Vol. 3, p. 1525. 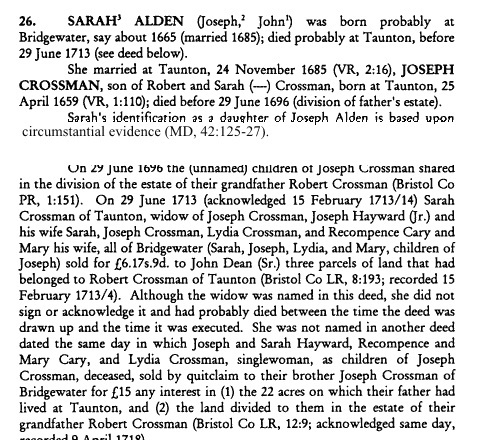 Sarah Alden was born perhaps about 1665. James Savage, A Genealogical Dictionary or The first Settlers of New England showing Three Generations or Those who came Before May, 1692 on the Basis of Farmer's Register, (1862) , vol. 4, p. 277. James Savage, A Genealogical Dictionary or The first Settlers of New England showing Three Generations or Those who came Before May, 1692 on the Basis of Farmer's Register, (1862) , vol. 1, p. 478. Seth C. Cary, John Cary, the Plymouth pilgrim, , at https://books.google.com/books?id=oDgcAAAAYAAJ . Boston, Massachusetts: (1911) , p. 74, section 16. Ancestry.com. New Hampshire, Death and Burial Records Index, 1654-1949 [database on-line]. Provo, UT, USA: Ancestry.com Operations, Inc., 2011. 1880 United States. Census Office. 10th census, 1880 federal population census, Washington, District of Columbia: National Archives and Records Service, ([19--]) , Census Place: Bow, Merrimack, New Hampshire; Roll: 765; Family History Film: 1254765; Page: 48A; Enumeration District: 162; Image: 0701. James O. Lyford editor, History of Concord, New Hampshire : from the original grant in seventeen hundred and twenty-five to the opening of the twentieth century, Concord, New Hampshire: Rumford Press, (c1903) , p. 1370. Harrison Colby, A genealogy of the descendants of Abraham Colby and Elizabeth Blaisdell, his wife, who settled in Bow in 1768, , at https://archive.org/details/genealogyofdesce00colb . Concord, N.H.: Printed by the Republican Press Association, (1895) Microfilm #896944 of the Family History Library, Salt Lake City, Utah, p. 68, #239. 1910 United States. Bureau of the Census. 13th census, 1910 population census schedules, Washington, District of Columbia: Bureau of Census Micro-Film Lab, ([19--?]) , Census Place: Somerville Ward 7, Middlesex, Massachusetts; Roll: T624_604; Page: 7A; Enumeration District: 1016; Image: 950. Edwin Alexander was born perhaps about 1846. 1880 United States. Census Office. 10th census, 1880 federal population census, Washington, District of Columbia: National Archives and Records Service, ([19--]) , Census Place: Bow, Merrimack, New Hampshire; Roll: 765; Family History Film: 1254765; Page: 48B; Enumeration District: 162; Image: 0702. Harrison Colby, A genealogy of the descendants of Abraham Colby and Elizabeth Blaisdell, his wife, who settled in Bow in 1768, , at https://archive.org/details/genealogyofdesce00colb . Concord, N.H.: Printed by the Republican Press Association, (1895) Microfilm #896944 of the Family History Library, Salt Lake City, Utah, p. 61, #215. Bow (New Hampshire). Town Clerk, Bow, New Hampshire town records, 1757-1977 and births, marriages, and deaths,1826-1915, Salt Lake City, Utah: Filmed by the Genealogical Society of Utah, (2001) , p. 321. 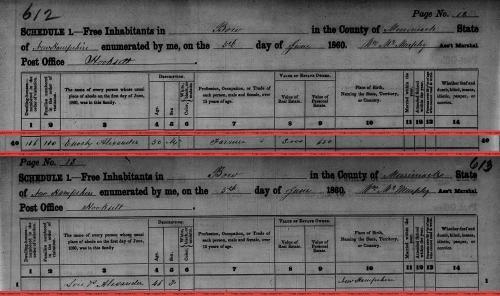 "Massachusetts Deaths and Burials, 1795-1910," database, FamilySearch (https://familysearch.org/ark:/61903/1:1:FHFB-SLK : 10 December 2014), Eliza J. Alexander Hubbard, 28 Apr 1890; citing , reference 3602; FHL microfilm 594,197. 1880 United States. Census Office. 10th census, 1880 federal population census, Washington, District of Columbia: National Archives and Records Service, ([19--]) , Census Place: Boston, Suffolk, Massachusetts; Roll: T9_558; Family History Film: 1254558; Page: 162.2000; Enumeration District: 720; Image: 0632. Rev. Nathan Franklin Carter, History of Pembroke, N. H.: 1730-1895, Concord, N.H.: Republican Press Association, (1895) , p. 340. Harrison Colby, A genealogy of the descendants of Abraham Colby and Elizabeth Blaisdell, his wife, who settled in Bow in 1768, , at https://archive.org/details/genealogyofdesce00colb . Concord, N.H.: Printed by the Republican Press Association, (1895) Microfilm #896944 of the Family History Library, Salt Lake City, Utah, p. 66. 1880 United States. Census Office. 10th census, 1880 federal population census, Washington, District of Columbia: National Archives and Records Service, ([19--]) , Census Place: Bow, Merrimack, New Hampshire; Roll: T9_765; Family History Film: 1254765; Page: 48.2000; Enumeration District: 162; Image: 0702. Harrison Colby, A genealogy of the descendants of Abraham Colby and Elizabeth Blaisdell, his wife, who settled in Bow in 1768, , at https://archive.org/details/genealogyofdesce00colb . Concord, N.H.: Printed by the Republican Press Association, (1895) Microfilm #896944 of the Family History Library, Salt Lake City, Utah, p. 67, #237.